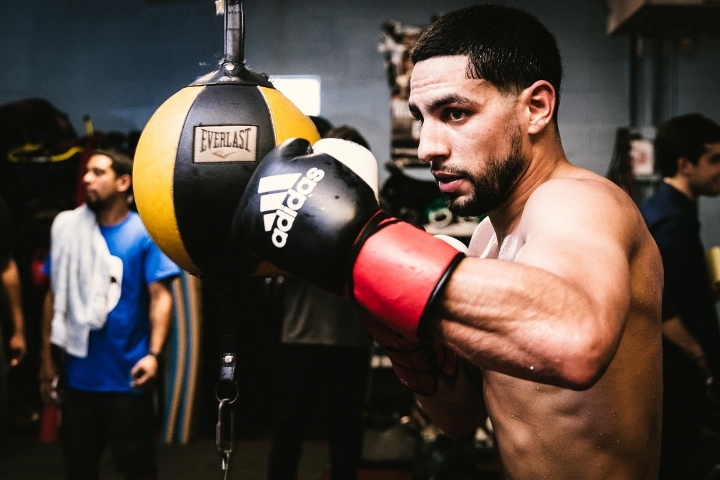 Though he’s a Philadelphia fighter with the requisite old-school mentality, the now-31-year-old understands the reality of modern boxing nearly two decades into the 21st century. Meaning that while he’d prefer to go straight into another career-defining championship scrap, he’s fully aware of outside-the-ring games that need playing before such things occur. Such are the circumstances that he’ll be contending with on Saturday. Five weeks after one welterweight carried a pay-per-view show in a football stadium – and within minutes of another who’ll top a Madison Square Garden marquee – Garcia will try to keep his place in line against rugged gatekeeper Adrian Granados at Dignity Health Sports Park in Carson, California. The fight will headline a PBC on Fox show that’ll begin at 8 p.m. ET. An hour later, the Top Rank PPV card supporting Terence Crawford’s defense against Garcia TKO victim Amir Khan gets underway in midtown Manhattan. “It used to bother me, but now I know it’s a business,” Garcia told Boxing Scene. “I understand that now. It’s all about timing. You just have to let everything play out, and then when the opportunity comes you’ve got to take advantage of it. It’s only the sixth time in seven years he’ll enter a ring without a title at stake, and it’s his first time in action since dropping a narrow nod to Shawn Porter for the vacant WBC crown last summer. That fight was one removed from Garcia’s first career loss, by similarly tight numbers, to Keith Thurman. Not surprisingly, the man dubbed “Swift” feels like neither L was warranted. He’ll arrive as the top contender to Porter, according to the WBC’s latest numbers, and is listed as the sixth-best 147-pounder by the Independent World Boxing Rankings – which include all fighters regardless of their sanctioning body titles or positioning. He’s surpassed on the latter list by only IBF champ Spence – who topped Mikey Garcia in the aforementioned high-profile stadium event – along with WBO kingpin Crawford, Manny Pacquiao, Porter and oft-sidelined WBA champion Thurman, who’s fought just once since beating Garcia in 2017. Garcia trails the same quintet, albeit in a slightly different order, in rankings from Ring Magazine. And they’re all fair game when it comes to what comes next, because he doesn’t see anyone in particular – outside of himself, that is – as prohibitively preeminent. “Whoever. Whoever,” he said. “They’re all exciting matchups. They’re all big fights. He wasn’t at all surprised at the ease with which Spence outclassed Mikey Garcia, and he expects Crawford to handle Khan – whom Garcia stopped in four rounds in 2012 – though he allowed for the idea that the enigmatic Englishman could manufacture an upset. Grit is a word frequently used alongside Granados, a 29-year-old Illinois resident of Mexican heritage who’s as well known for near-misses against Porter and Adrien Broner than for any of his 20 victories in a career that dates back to 2008. In fact, he’s never won a fight that’s gone past eight rounds – most notably a 2015 TKO of then-unbeaten junior welter Amir Imam – and has additional majority/split losses against the likes of Felix Diaz (MD 10), Brad Solomon (SD 10), Frankie Gomez (MD 8) and Jose Juan Fuentes (SD 4). Not to mention draws against the likes of Kermit Cintron and Lanardo Tyner. Two straight wins have come since the Porter fight, however, albeit in a pair of fights in Culiacan, Mexico against dubious opponents with a combined record of 32-29-3. “He has a big heart. I know he’s hungry. I know he wants to win,” Garcia said. “So I’ve got to make sure that I’m 100 percent ready – like I am – and go in there and just dominate and control the fight like a true champion. I’m ready for 12 rounds. I get the impression he ls fighting to survive the GAME. Playing it safe is his speed now. Might as well retire if he has no faith in himself. Ridiculous article as he was offered Crawford and turned it down. He is one of the guys who has bled PBC morons for huge paydays even when he fights mediocre opponents so be is more than happy with his situation.